Removing old paint off basement walls is a time-consuming effort. Basement walls present a challenge because the cement walls are porous, and this makes paint removal difficult. The temptation is to scrape all the loose paint off and then repaint the walls. This is one option. However, with a little more effort it is possible to remove all the old paint. This is the better solution as it ensures that the walls are thoroughly clean. Then, you can repair cracks and apply sealant if needed, and you can add a new coat of paint to make the walls look brand new. Cover the basement floor with tarps. It is important to cover the floor because paint removal can be a messy process. You can use inexpensive plastic or paper tarps, but tape them to the floor to keep them in place. Scrape off all the loose paint. 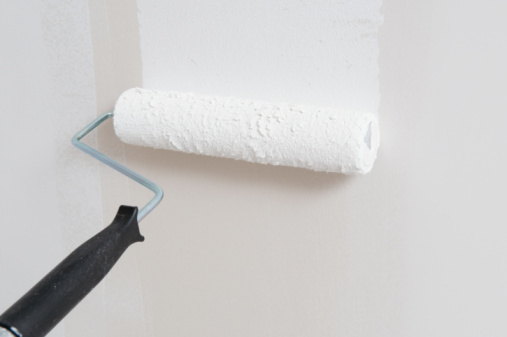 You can use a putty knife, paint scraper or wire brush. It is not necessary to spend a lot of time at this stage. Protect yourself with a mask. Simply walk around the basement and knock off any loose paint. If it doesn't come off easily, then don't worry about it. Determine if the old paint is oil-based or latex. This information is needed to decide what kind of paint stripper to apply. Clean a small area of the wall with warm water and detergent. Dry the area with a towel. Dip a rag in alcohol and rub over the area. If paint comes off on the rag, the old paint is latex. If no paint or a very little amount comes off on the rag, then it is oil-based paint. Apply the paint stripper to the wall. There are different sorts of chemical paint strippers. The best one to use is Peel Away. It is environmentally friendly and less messy to work with. If the old paint is oil-based, use Peel Away 1. If it is latex paint, use Peel Away 7. Put on work gloves and concentrate on one section at a time. Peel Away is a paste that can be either spread on or sprayed on. Once the paste is applied, it is covered with laminated paper strips. Let the paste sit overnight. Peel the strips off. The paste and most of the strips will come off on the paper. Clean up the paper strips and the tarps. The quickest way is to put the paper strips in the center and roll them up in the tarps. Place everything outside in the garbage.